Whisk all of the ingredients together in a bowl until well blended. Place the peanut butter in an airtight container and store in the refrigerator for 6 to 8 weeks (if you can keep from eating it for that long!). Lay out two slices of the bread on a cutting board. Spread both slices of bread with peanut butter. Set one aside. 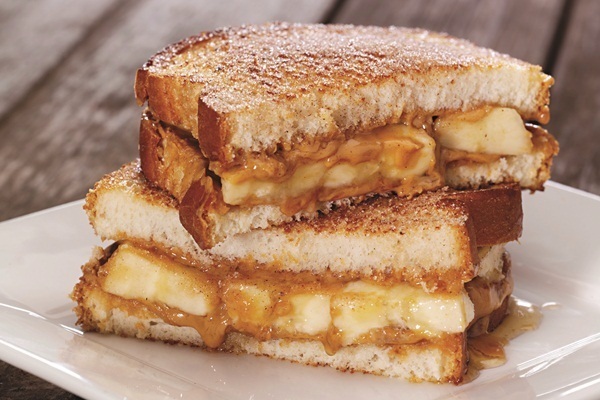 Take one slice and top with sliced bananas, then drizzle with honey or agave. Place the reserved slice of bread on top. Brush top and bottom of sandwich with room temperature margarine or oil. If you own an electric sandwich maker or Panini press, place sandwich inside for 2½ to 3½ minutes. If you do not have a sandwich press, place sandwich in a sauté pan on top of your stove, set at medium heat; and cook for 3-1/2 to 4-1/2 minutes on each side. While cooking, combine cinnamon and the sugar in small bowl. Remove sandwich and while still hot, season liberally with cinnamon and sugar.